Why should a contractor care about a subcontractor’s insurance? What does this mean? Your policy requires you to have a written agreement with the subcontractor which we refer to as an insurance, indemnification and hold harmless agreement. This agreement contractually requires the subcontractor to have you named as an additional insured on the subcontractors insurance policy and to obtain the policy listing you as an additional insured. What are the effects? In the event a subcontractors employee is injured at a job site, it is inevitable that you will be sued under New York State Labor Law which holds owners and general contractors liable for injuries that occur on a job site. Upon notice of the injury and later upon receipt of the summons and complaint, you forward the papers to your insurance broker and to the insurance company. In the event it is discovered that you did not have the required written agreement with the subcontractor or the subcontractor did not have insurance listing you as an additional insured, your insurance company may reject coverage and you will be responsible to pay for all defense attorney costs and any judgment that results. The effects can cause financial ruin. While many contractors have worked with the same subcontractors for years, on a hand shake, you must update your practices or you will risk substantial exposure. Additionally, if a subcontractor uses undocumented workers and does not provide the proper workers compensation insurance, this can also cause substantial exposure to your company. If you have made sure all subcontractors have signed the proper insurance, indemnification and hold harmless agreements and made sure that you have been named as an additional insured on the subcontractors policy, your insurance company should provide coverage or they will fight for coverage under the subcontractors policy. Additionally, if the subcontractor signed the insurance, indemnification, hold harmless agreement but did not obtain the proper insurance, you would be able to sue the subcontractor on a breach of contract claim. Don’t get caught without coverage. Get it in writing and insist on coverage from all your subcontractors. Is a Certificate of Insurance (COI) enough? No! There is a common misconception in the construction industry that a certificate of insurance (sometimes referred to as a COI) provides the certificate holder with insurance coverage and protects them from loss. This is a dangerous mistake. 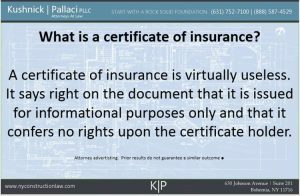 A certificate of insurance is issued “for informational purposes only.” It says so right on the document itself. Even if you get a certificate of insurance you must still get a signed indemnity agreement and you should always request to see a copy of the actual insurance policy to make sure that it provides the protect that you think it does and to make sure that you are a proper additional insured under the terms of the insurance policy. Do I really have to read every insurance policy from my subcontractors? You should. There is no substitute for actually looking at the policy. 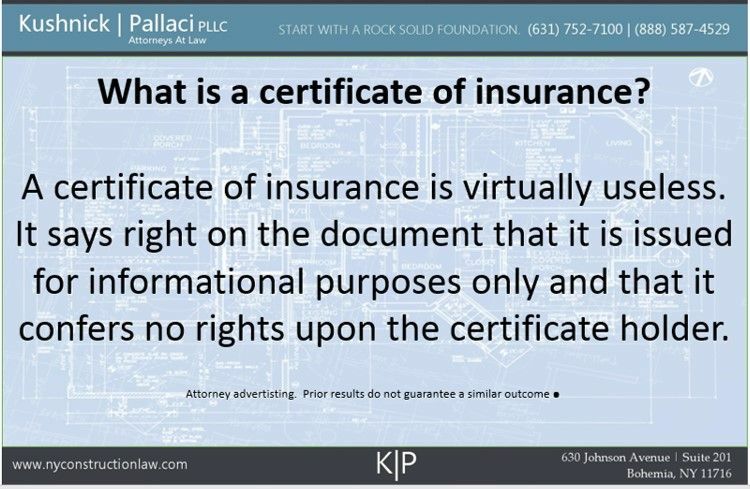 If you don’t want to read the entire thing you can ask your broker and/or your attorney for help and you should, at a minimum, get the declaration page and review the endorsements and exclusions. When in doubt, consult with your attorney. You can contact one of your construction attorneys here to discuss whether you are properly protected in the event that someone gets injured on your project. This entry was posted in Construction Litigation, Construction Safety, Insurance, OSHA, Subcontractors and tagged certificate of insurance, indemnification, indemnity, Insurance, Insurance Claims by admin. Bookmark the permalink.